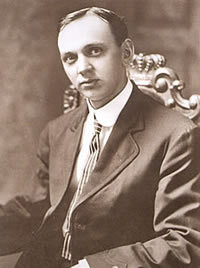 "Edgar Cayce (/ˈkeɪsiː/; March 18, 1877 – January 3, 1945) was an American mystic who answered questions on subjects as varied as healing, reincarnation, wars, Atlantis, and future events while in a trance. A biographer gave him the nickname, "The Sleeping Prophet." A nonprofit organization, the Association for Research and Enlightenment, was founded to facilitate the study of Cayce's work. A hospital and a university were also established. Cayce is a well-documented psychic of the 20th century. Hundreds of books have been written about him. Cayce's practice of reading through the entire Bible each year was thought to give him the insight to reconcile his Christian beliefs with the metaphysical information provided while in trance, and some consider him the true founder and a principal source of the most characteristic beliefs of the New Age Movement."